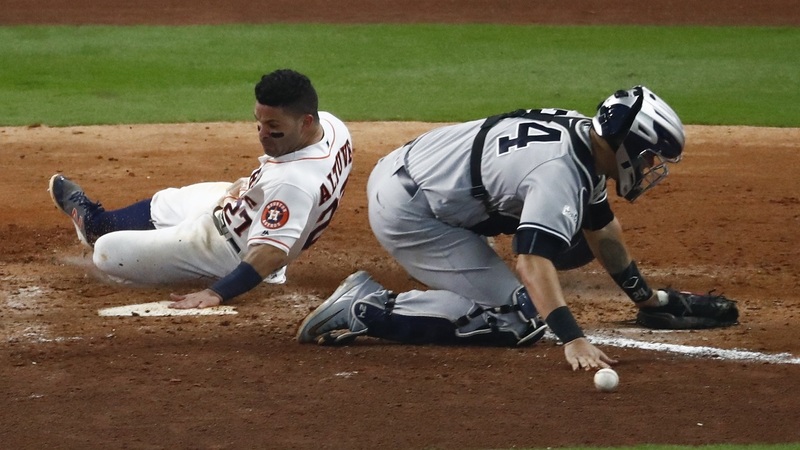 HOUSTON, Texas (WABC) -- Stop me if you've heard this before: the Yankees lost a postseason game on a walk-off hit after a costly mistake on the base paths and now find themselves in a two-game hole. Let's focus on the base running mistakes for now. In Game 1, it was Greg Bird. He tried to score on a single to left by Aaron Judge but was gunned down at home by Houston's Marwin Gonzalez. The throw got there just in time to nab the not-so-fleet-a-foot Bird. Joe Girardi could have challenged, but thought better of it. "We thought he was out," said Girardi after the game. "God knows I'm not doing that again." The Yankees would go on to lose that game by one run. On Saturday, it was Brett Gardner's turn. He shot a double into the right field corner and seemed content with a two-out double (most players would have been). Gardner picked up the pace as he rounded second when he spotted his third base coach, Joe Espada, pushing him to go for the triple. The umpires ruled him safe, even though everyone on the field seemed to think he was out. Gardner included. The Astros even walked off the field before the play was overturned. Houston's Josh Reddick and Carlos Correa executed a perfect relay throw, but the Yankee outfielder took full responsibility. "I should have stayed at second," Gardner said in the clubhouse after the loss. So here we are again. The Yankees find themselves down two games to none as they head back to the Stadium for Game 3. Not an ideal spot for the Pinstripes, but recent history would say otherwise.